New Peugeot Boxer Professional CanDrive Flexi 17 seat School Minibus in Aluminium metallic silver paint finish with alloys. You CanDrive this Minibus on a car licence, no D1 required (conditions apply). Fully maintained lease to include full maintenance, servicing, breakdown cover, tyre replacement and puncture repair, annual MOT and road tax costs covered. Price is based on a 5 year leased with a contract mileage allowance of 25,000. IVA certified and first registered as a Minibus. 4 way heated electric wing mirrors, electric windows, glazed heated rear doors, reverse parking sensors, central locking, integrated touch screen sat nav, c/d player USB input, DAB radio, cruise control and air conditioining. Glazed all round including 2 x vented, slide opening windows. 14 x M2 tested/certified rear saloon seats, fitted with red 3 point all age adjustable seat belts, anti vandal ABS plastic seat backs and finished in Peugeot trim to match the driver and front passenger seat. Side step under sliding door entrance with twin full height handrails and courtesy panel. 4 x rear removable seats to accommodate luggage space or occassional carriage of a wheelchair user. 4 way opening coach style pop up roof vent. Option extras can include overhead parcel shelves for extra storage space, reverse parking camera. 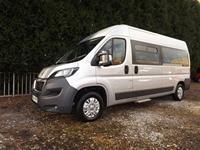 Purchase this Minibus from £25,995 vat or lease from as little as £14 vat per day over 5 years. Minibus leasing, long term hire and minibus contract hire options (with or without servicing) are available on this Peugeot Boxer 17 Seat Minibus.